Rounds 7 and 8 of the 14th Bangkok Chess Club Open 2014 saw again exciting and some very long-fought games at the top boards. In the much anticipated round 7 clash between German GM Jan Gustafsson and Open leader GM Francisco Vallejo Pons, the players drew after solid play on both sides. Obviously, the teammates of German chess league winner OSG Baden Baden know each other very well and may find it hard to surprise each other in the opening. Playing with white, GM Gustafsson put pressure on ‘Paco’, but the Spaniard’s choice of the Nimzo-Indian Defense proved to be a good one. He equalized in the middle-game and a draw was agreed on move 34. 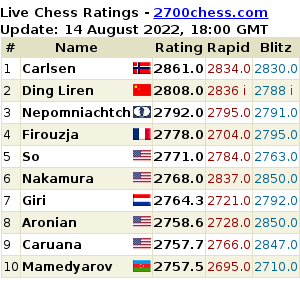 This result made it possible for several players to close the gap. GM Oliver Barbosa won against fellow Filipino GM Laylo Darwin on board two, GM Suat Atalik had obviously recovered from his defeat against GM Vallejo Pons in the previous round and won against GM Marat Dzhumaev in a 92-move marathon match. 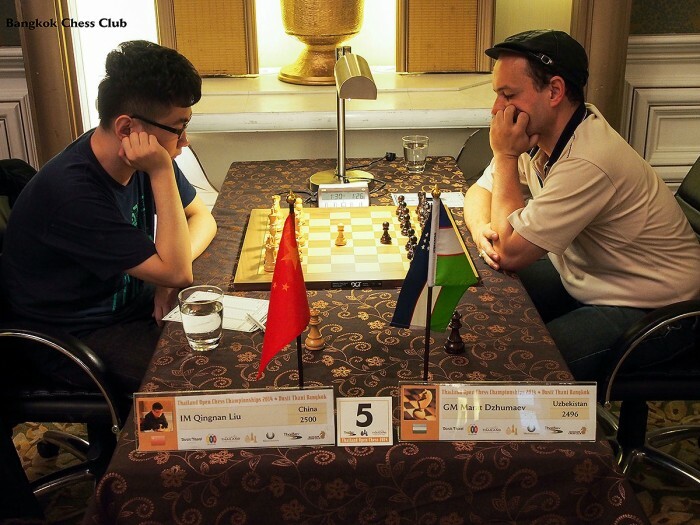 IM Qingnan Liu also used the opportunity to stay on track to success with a fine win against GM John Paul Gomez. In round 8 the four leading players of the tournament were paired against one another, as were the four players on their heels. GM Vallejo Pons reached a clear advantage early in the game, but IM Qingnan Liu was tough and fought on until he finally had to resign in a rook vs. 2 pawn endgame. GM Suat Atalik again played a five-hour game, but this time lost against GM Oliver Barbosa. The Turkish GM must be commended for his outstanding fighting spirit. He has won six and lost two games with no draws to his account. GM Barbosa and GM Vallejo Pons are the two leaders before the ultimate round tomorrow. They will cross swords in what promises to be a nail-biting finish to the tournament. While GM Barbosa has the small advantage of playing with white, GM Vallejo Pons had the much shorter game today and may be more refreshed going into the last round. The winner will be new BCC Open champion. But if they draw, either GM Jan Gustafsson or GM Bartosz Socko may pull even with the two leaders in their matchup on board two. Both players are trailing the leaders by only half a point. In the Challenger category, things have been heating up as well, and the last round has to decide over who will be the new champion. In round 5 the sole leader Behrang Kaboodi (4 pts., Elo 2064) lost against Andrej Vospernik (3½, 2053), which made the latter player tournament leader. Leandro Alidani (3½, 1959) won against Ko Khin (3½, 2087) on board 2. In the round 6 clash between leaders Andrej Vospernik (4½) and Leandro Alidani (4½), the Filipino player kept the upper hand and is now the sole leader before going into the final round.